What to do and see in Madrid? Madrid is the capital of Spain. Located in the middle of the country, 660 metres above sea level it gets extremely hot in summer and cold in winter, like many other interior cities in Spain. If you don't like walking in temperatures of around 40ºC it is not advisable to visit Madrid in the Summer. On the other hand, if you don't mind the heat but don't like crowds, August is the best month as thousands of Madrileños leave the city to spend their holiday month elsewhere. Madrid is well equipped for tourisim with its large number of hotels and restaurants. It is well connected to the rest of the country by road and rail. The city itself has an extremely user-friendly underground system, bus network and local trains to surrounding areas. As in any major European capital city, stations get extremely crowded during rush hour times. Madrid is a charming city with a lot of personality. People from Madrid are friendly and hospitable. There are many historical buildings and sights to visit. 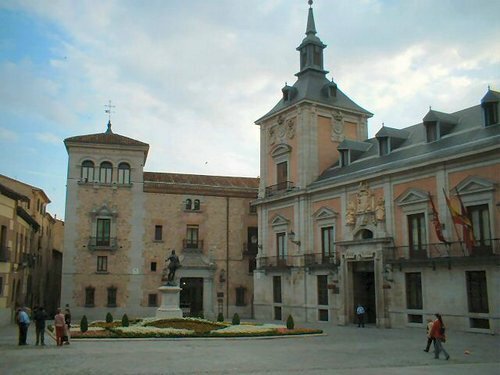 For further information see: museums, palaces, parks and sights in Madrid. Madrid is a lovely city to walk around, full of interesting plazas, buildings, parks, shops.... Here are a few recommendations of the best places to stroll around to get a real feel of the city. 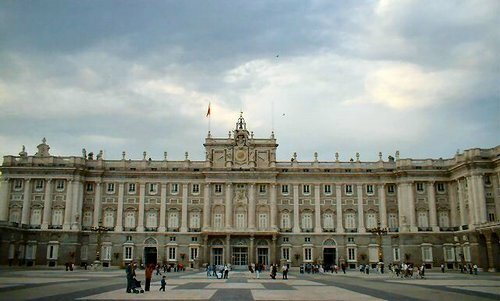 For more detailed description of Madrid's main sights, click on the links at the bottom of the page. Barrio del Madrid Antiguo or Madrid de los Austrias: this is an old neighbourhood full of bars, pubs and restaurants with lots of history. It is where you can find many of Madrid's oldest buildings, squares and monuments such as the Palacio Real, the Opera House, the famous Puerta del Sol where Madrileños gather to greet the New Year, the Plaza Mayor, the Arco de Cuchilleros, the Basílica de San Miguel, the Almudena Cathedral, the Encarnación Monastery, the Descalzas Monastery, la Casa Cisneros, la Colegiata de San Isidro and the Santa Cruz palace...A walk along calle Mayor, which goes from the Palacio Real to the Puerta del Sol, and which is full of shops of every type is definitely recommended. Also recommended is a walk along calle Arenal, the location of an old church called Iglesia de San Ginés and many interesting shops. The area known as Madrid de los Borbones, is another place which shouldn't be missed. 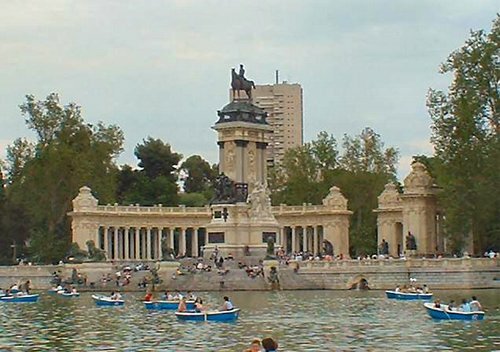 This is where the famous Retiro park is located. The Barrio de Salamanca, is one of Madrid's most exclusive areas where the most expensive designer shops, art studios, hotels and residences are located. People who enjoy window-shopping are advised to stroll along the streets Serrano, Velazquez and Claudio Coello. Two well-known plazas (Plaza Cibeles and Plaza Colón) are in Salamanca, as is the Retiro Park with its boating lake and open-air artists and buskers, the National Library, the Arqueological Museum and the Real Jardín Botánico (Botanic Gardens). 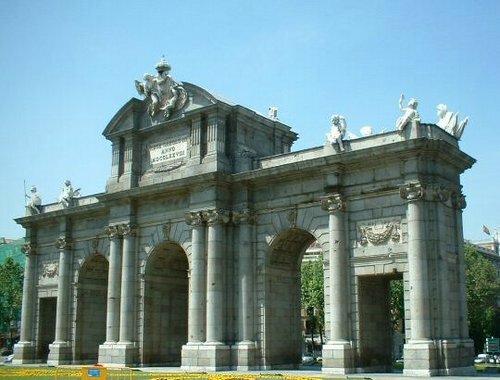 To the west of the city you have the Gran Vía, a commercial street where many theatres, cinemas and restaurants can be found as well as the Gran Casino de Madrid. The Plaza de España and the hill known as la Cuesta de San Vicente, which goes down from the Estación del Norte (the North Station) and along el Paseo de la Florida, eventually takes you to the Ermita de San Antonio de la Florida. From the Plaza de España you can easily get to the Parque del Oeste or de Rosales where you can visit the Templo de Debod. In the east of the city you can visit the famous bullring la Plaza de Toros de las Ventas, in the street called calle Alcalá. To the south of the city you can find interesting areas such as La Latina and Lavapiés. This is where the famous Rastro flea market is located. The Reina Sofia Museum of Art is situated between el Paseo de las Delicias and el Paseo de Santa María de la Cabeza, Embajadores and la Ronda de Atocha. The Paseo de la Castellana is the centrepoint of the city. It crosses from the north to the south of Madrid (the impressive Kio towers are situated in the Plaza Castilla), it continues until the Plaza Colón where it becomes the Paseo de Recoletos until the Plaza de Cibeles (flanked by the main headquarters of the Bank of Spain and the Post Office) where it becomes the famous Paseo del Prado. This continues until la Glorieta Carlos V, next to the Atocha railway station. The headquarters of banks, and the most important national companies are all found on the Paseo de la Castellana as well as the most famous museums and galleries: the Thyssen, the Prado, the National Library, the Science Museum...There are also a number of government ministeries here too: (the Ministry for Work, the Ministry of Defence...). The Museum of Sculpture can also be found here with exhibits from contemporary artists such as Botero and Chillida as well as buildings such as the Picasso Tower, the Tower of Europe and the world famous Santiago Bernabeu football stadium, home to Real Madrid. Look for the best hotel deals in Madrid. Search results appear in a new window (pop-up).